“The silence breakers” are Time’s 2017 Person of the Year. Time’s 2017 Person of the Year Isn’t Trump. It’s a Rebuke of Trump. Just a few of “the silence breakers” who have been recognized as Time magazine’s Person of the Year. One year ago, a man widely accused of sexual misconduct was interviewed by a man who has now himself been accused of widespread sexual misconduct on the Today show about being named Time’s 2016 Person of the Year. A few days later, at a rally in Des Moines, Iowa, the former lamented the fact that he had been named person instead of man of the year. What a difference a year makes. On Wednesday, Time named “The Silence Breakers”—those who have publicly spoken out about and taken action against sexual harassment and assault—the 2017 People of the Year. The award has gone not to Donald Trump, as he bragged it might have, but to the women (and some men) who have broken the kinds of silences and norms that have allowed men like him to thrive. 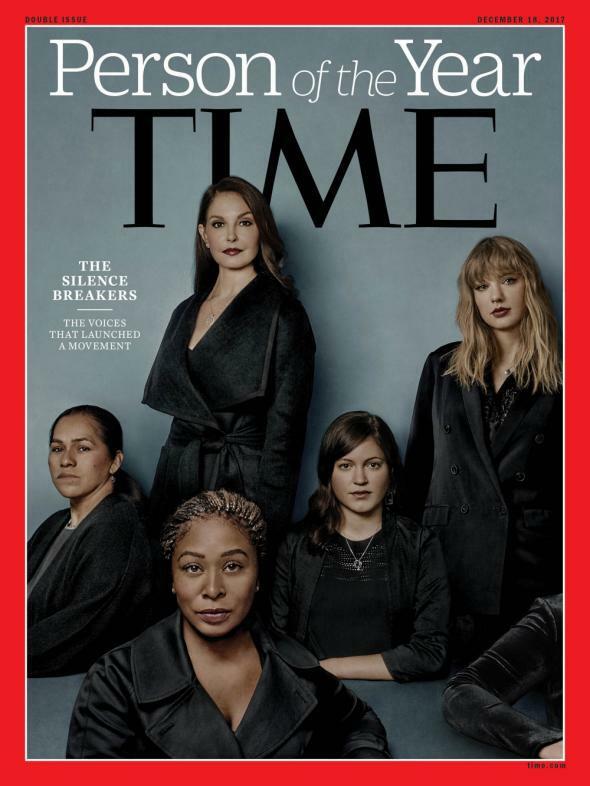 The Time cover features six women who have spoken up against harassment this year: actress Ashley Judd, singer Taylor Swift, former Uber engineer Susan Fowler, Californian lobbyist Adama Iwu, strawberry picker Isabel Pascual (whose name was changed in the story to protect her family), and an anonymous hospital worker from Texas. But the piece makes clear that the movement is bigger than any individual person and that the award is for all those who have done so. Time interviewed dozens of people, from professors to hospitality workers to entrepreneurs to senators, from famous actresses like Rose McGowan and Selma Blair to the women who have sued New York’s Plaza Hotel for normalizing and trivializing harassment in the workplace. There are conversations with Tarana Burke, who started the #MeToo movement in 2006, and men like Terry Crews, who has come forward with stories of man-on-man harassment. The roots of TIME’s annual franchise—singling out the person or persons who most influenced the events of the year—lie in the so-called great man theory of history, a phrasing that sounds particularly anachronistic at this moment. But the idea that influential, inspirational individuals shape the world could not be more apt this year. Donald Trump undeniably influenced the events of 2016, and in a way, the 2017 award is still about him. His name comes up multiple times in the cover story, from references to the Access Hollywood recording to the Women’s March, with one expert calling him a “visible precipitating factor” to the movement: his presidency and his blatant misogyny that have galvanized women more than almost anything else this year. One can’t help but read Time’s choice as a direct rebuke to the man sitting in the Oval Office. It’s a small, but powerful, consolation prize.